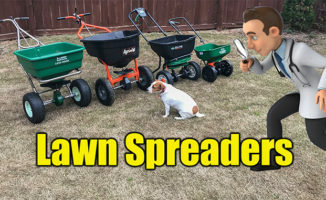 In this video Doc reviews his new Scotts Elite lawn spreader. There is a product link below. If you base the cost / quality ratio he gives it a B+ or even an A- . It’s important to remember that we are NOT comparing $500 spreaders but a larger decent quality spreader for the home owner. Click the spreader to see current pricing. Scotts® Elite Spreader has dual rotors provide increased accuracy and a 6 ft. spread pattern, which means you make less passes across your yard, saving you time. The large hopper holds up to 20,000 sq. ft. of lawn product. The ergonomic handle provides comfort, while featuring a smartphone holder. The 10-inch tires are foam filled, so they won’t ever go flat.